Rockland Window Coverings—conveniently located in Spring Valley, New York (NY)—is your most trusted source for custom sheers and shadings from Hunter Douglas. We also proudly carry the full selection of Hunter Douglas blinds, shades, plantation shutters, and motorized window coverings. Contact us today! If you are in the market to update your window treatments, consider Hunter Douglas shades and sheers. Shadings and Sheers are available in wide range of styles, colors, light control levels, and functional options, making these window treatments the perfect choice for all decors. These innovative and advanced window treatments will add beauty to your home while also helping to protect your home and family from harmful UV rays. Luminette® Sheers are an elegant take on the traditional vertical blind. Ideal for wide and tall sections of windows and sliding glass doors, this window treatment elongates the line of your room and makes spaces feel bigger. Available in a wide range of soft, drapery-like fabrics to soften up your entire home, Luminette® sheers provide you with excellent levels of light control and diffusion, as well as privacy throughout your home. Luminette® Privacy Sheers are the perfect option for keeping your home secure without needing to worry about blocking too much natural light. Because these window treatments hang freely on the bottom, they are perfect for easy adjustment and maneuvering. 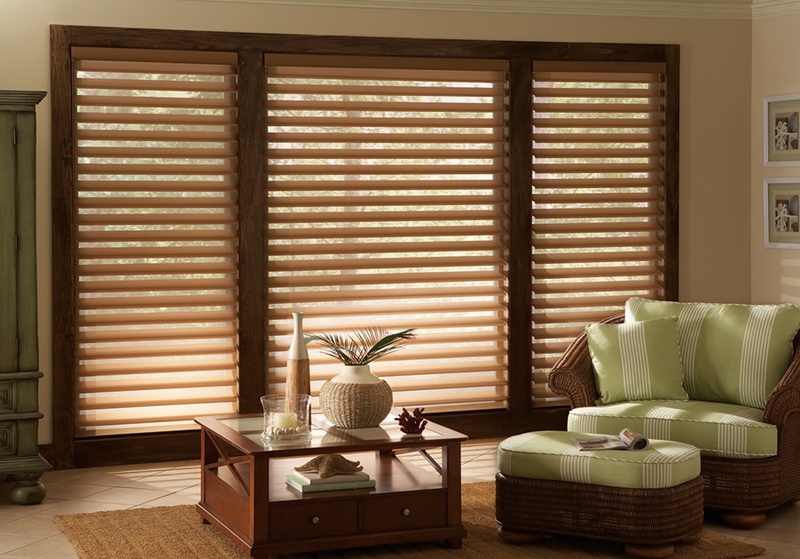 Silhouette® Window Shadings are expertly crafted. Featuring soft fabric vanes that appear to be floating between layers of sheer fabric, these window treatments are available in a wide range of colors options to catch the eye of anyone who sees them. Providing your windows with unmatched light diffusion without sacrificing any function, they are perfect for any décor. Pirouette® Window Shadings are just as light diffusing but allow for a more enhanced view to the outside of your windows. These shades feature soft, horizontal fabric vanes that are attached to only one layer of sheer fabric from behind. Pirouette® shades can be easily maneuvered to redirect and diffuse direct sunlight throughout your home. Modern and sophisticated in style, Hunter Douglas Window Shadings will transform your home with natural light and protect your belongings and family from harmful UV rays. If you are interested in any of these excellent Sheers and Shadings, contact the window treatment experts at Rockland Window Covering today! Proudly serving Spring Valley, New York and the surrounding area, including Pomona, NY and Saddle River, New Jersey, our team of experienced professionals can help you redesign and reimagine the way you see your windows. Set up an appointment or stop by our showroom today to get started.